Actually, this doesn't make any sense even when you HAVE read the comic. I really want to be able to make one of my own comics properly media-spanning someday. There have been attempts in the past by many to at least expand into audio and video — some successful, some just weird. Recently, I hit a point in my personal life where there was just no time to read my daily blogs or comics. Just none. Some friends of mine during this time were recommending what sounded like a rather daunting read archive-wise, which I promised I’d get around to once I’d played two-month catch-up with my regular reads. Thing is, what they’d described — and what little out-of-context content I’d seen — seemed to be of that seemingly unattainable nature. So last week, once I’d gotten all the way from @Tavicat to Zero Punctuation, I decided to tuck in to Homestuck. The first thing you notice is that the presentation is that of a text-based RPG with a one-panel illustration. While the most you actually do to start is click HTML links to move forward, it is set up to be rather obviously reminiscent of Zork and Colossal Cave. And while you’ve got no actual control, many of the actions are things you’d likely do if you were ever a smartarse with these games in the first place. You “control” Zoosmell Pooplord John Egbert, who is celebrating his thirteenth birthday. One of his birthday acquisitions is a beta of the fictional game Sburb, a fourth-wall-breaking sim that (to some degree) explains the video game-esque nature of your actions. A game system involving storage cards, deliberately very difficult to crack, is introduced early, as well as the idea that others in possession of Sburb can influence John’s environment — in particular an initially anonymous IM pal who goes by the screenname tentacleTherapist. The two muck about with John’s house, exploring the game’s mechanics while his father is away. 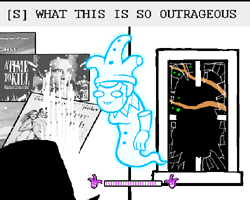 The thing about “Homestuck” is that, much like a Sunrise anime series, it switches rails at a certain point, leaving you wondering what you’ve gotten yourself into. Once the story starts on its new path, more characters are introduced, such as the macabre knitting enthusiast Rose (nee tentacleTherapist), the puppet-phobic Dave who likes everything ironically, and a mysterious hooded figure who appears to exist in some sort of dystopian pre-Canticle for Leibowitz environment. By this point, the comic has truly branched out. Where before it was mainly still images (thought some were actually animated GIFs to show action) and expandable chatlogs, once the “real” story starts it expands outward. It brings a lot more Flash content, even beyond some low-level interaction, with a soundtrack (which we’d had limited exposure to before when a character decided randomly to throw down a sweet jam rather than take action) and some quite frankly lovely animation. One thing I’ve noticed while watching/reading/playing — and I will admit, I still have a ways to go because it’s one hell of an archive — is that on an occasional piece of content, usually a “game,” there will be a thank-you shout-out to someone who helped put that particular update together. I’m sure our artist/writer is a talented individual to have come up with this storyline and simplistic-but-not-simplistic art style, but this is a very good example of what not everyone thinks to do. I’ve personally helped other comics in the past with everything from sound-mixing to lyric-writing, but I think there’s a sort of mentality of pride/independence that impedes that on occasion. The layout, while seemingly simple, provides for both archiving and the insertion/embedding of different forms of media (not just images) into archived updates — a bit of a finicky trick, in my experience. And then sometimes they just toss in a chat log. In other words, while the archive is consistent, the content it’s programmed to pick up and archive is inconsistent. And there is my personal brick wall. “Homestuck” is a collaborative effort (credit is given to programmers and composers on a regular basis), and for something of that nature it has to be. Truly multimedia, properly multimedia, is — as it were — bigger than you or me. Unfortunately this takes one (or both) of two things — money, or talented friends with as much time on their hands as you have. For someone who runs their comic as a business, that’s pretty much a wise investment. But for those of us who don’t? We may just have to reset our sights and priorities if we want to pull off something even close to this scale. Approximately how long did it take you to go through this archive? Because this sounds like something I’d want to tuck into. I’m actually still going through it. It’s a very involved read, as some pages have ‘chat logs’ between the characters that you can expand and read. I just do a bit each day. But it’s worth the time spent.